It seems like all of a sudden the US SpaceRock scene has exploded, with more bands playing the music than this thirty-year veteran could ever imagine! Just 10 years ago one could only sight F/i, Alien Planetscapes and ArcMet as dedicated and homegrown in the genre. But new bands are coming to the attention of listeners at a rapid rate. "TOMBSTONE VALENTINE" came to my attention almost inadvertently as I was sent their LP as part of a promotional package sent to expose Alien Planetscapes members to what our prospective stablemates on Aether Records were playing. Further examination of the presskit caused me to play their work first. So I slipped the LP onto my very battered turntable. and was immediately impressed by the best debut by a US SpaceRock band I've heard this year! Here's a band that DOESN'T SOUND LIKE HAWKWIND, something too many fall into too easily! "TV" has got that completely covered, opting for an original soundmodel woven together from elements of 1967 Pink Floyd, Amon Düül I, Third Ear Band, even a little SteelEye Span (though these folk don't play folk!). "Hidden World" opens the LP, FuzzBass driving us into a simple droning riff, the platform on which Richelle Toombs' exquisite voice dances, her voice evoking images more reminiscent of the downstate area of the band's native state (Indiana), but she could also be alluding to the surface of a far off planet untouched by human faults and frailties. Percussion and guitar move the track along in very sympathetic fashion. "Triple O Shuffle" begins in a somewhat similar manner, percussion and Bass laying it down in a more subtle manner, while Synthesizer rides over the top... this really could've fit on an LP like "Phallis Dei"! A nice smooth excursion, but this track suddenly fades, a much too short taste! "Green Sky Night" opens with Bass, synthesizer wind, some truly fine Farfisa Chords, and Richelle's vocal gymnastics again, backing vocal by Keyboardist Diane Hancock, Greg Toombs' wha-wha guitar licks maintaining links to players like Syd, never overpowering the music with screaming solos, he maintains the unique ability to play the music with the group! Rick Wilkerson's Basswork holds the bottom together, and the lack of kit drums never hinders the rhythmic aspect. It just allows them to keep the volume down and immerse the listener. "Elastic Reality" is the LP's centerpiece, nearly 20' minutes of improvisatory splendor! Based on what sounds like two different drones played on two different Farfisa Organs (very marvel Transistor Organs manufactured in Europe, Japan & the US 1960-1977; Farfisa still exists as a software company marketing Synthesizer/Keyboard/sampling programs!) Over this, Guitars play all sorts of arabesques, and more sound is generated by a piano frame being plucked & struck! Synthesist Randy Schwartz provides another undercurrent, rising and falling in the soundfield as the other instruments in the collective do, interacting, never dominating, performing brilliantly throughout this recording! Bravo to one of the genre's newest bands, I myself am eagerly awaiting their next release! Fans of US SpaceRock would be foolish to miss this great unit! 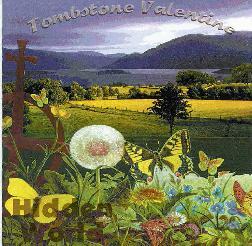 You can visit Tombstone Valentine at their web site. You can also visit their label, Aether Records.